charmcityartsmaven: CREATIVE ALLIANCE TO HOST BIGGEST PARTY OF THE YEAR! CREATIVE ALLIANCE TO HOST BIGGEST PARTY OF THE YEAR! Boogie the night away at our building-wide Disco Nights Party! 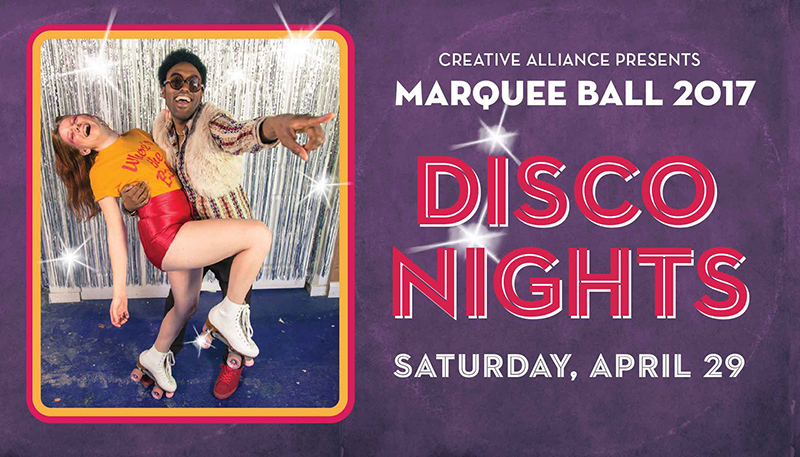 Get down to your favorite Disco hits in the Theater all night long with Baltimore’s all-star band organized by Matthew Pierce (Arbouretum, Big in Japan) and Stephen Strohmeier. Rolled Gold features Katrina Ford (Celebration), Hanna Olivegren (Zomes), Walker Teret, Sheila Ford, Charisse Nichols, and more special guests! Enjoy live soul music all night in the Marquee Lounge by Jonathan Gilmore and friends. It's My Skate Night is a group of talented skaters whose goal is to affect positive change and create awareness around the roller skating community. They've been featured at Artscape and have gained fame for dancing in the streets of Baltimore! The Marquee Ball Auction Exhibition curated by Executive Director of Goya Contemporary Amy Eva Raehse, Artist Lat Naylor, and Creative Alliance Exhibitions and Programs Manager Jeremy Stern, features more than 80 artists from Baltimore and beyond. This year all artworks are valued under $500! On View: April 22-29 | Bidding closes at 11pm during the Marquee Ball. Open Studios, roaming interactive performers, Pixilated photobooth, delicious '70s party food, beer, wine, and cocktails. Costumes encouraged! Check out our Pinterest Board for ideas! Complimentary beer and cocktails from Union Craft Brewing, Monument City Brewing Company, The Baltimore Whiskey Co., Lyon Distilling Company, and FOREMAN WOLF.